The Keysight DSOX-3104A is available to buy refurbished used or rent, usually from our UK stock. Click here to download the Keysight DSOX-3104A datasheet. The InfiniiVision 3000 X-Series offers entry-level price points to fit your budget with superior performance and optional capabilities that are not available in any other oscilloscope in its class. Our breakthrough technology delivers more scope for the same budget. largest screen in its class, the deepest memory and the fastest waveform update rates. Do more with the power of 4 instruments in 1: oscilloscope, logic timing analyzer, WaveGen built-in function generator (optional) and protocol analyzer (optional). Get more investment protection with the industrys only fully upgradable scope, including bandwidth. Engineering for the best signal visibility starts with the largest display. Our 8.5-inch WVGA display offers 50% more viewing area with 3.4 times the resolution (WVGA 800x480 versus WQVGA 480x234). With Agilent-designed MegaZoom IV custom ASIC technology, the 3000 X-Series delivers up to 1 million waveforms per second. If an oscilloscope updates waveforms slowly, it can make using the oscilloscope very frustrating. Fast waveform update rates can improve oscilloscope display quality to show subtle waveform details such as noise and jitter with display intensity modulation. Most importantly, fast waveform update rates improve the probability of capturing random and infrequent events that would not be captured using an oscilloscope with a lower waveform update rate. .
With up to 4 Mpts of MegaZoom IV deep memory, you can capture long, non-repeating signals while maintaining a high sample rate, then quickly zoom in on areas of interest. The InfiniiVision X-Series optimizes your deep memory oscilloscope measurements by using MegaZoom IV technology to make the most effective trade-offs in sample rate, memory depth and waveform update rate. Although you may think deeper memory is always better, using deep memory means making tradeoffs for many other scopes on the market today. Scopes with deep memory are typically priced higher, and require additional waveform processing time to acquire deep memory waveforms. This typically means waveform update rates will be reduced, sometimes significantly. For this reason, most other scopes have manual memory-depth selections, and the typical default memory depth setting is usually relatively shallow (10 to 100 kpts). If you want to use deep memory in these other scopes, you must manually turn it on and deal with the update rate tradeoff. So you have to know when it is important to use deep memory and when it is not. Agilents exclusive MegaZoom IV technology automatically selects deeper memory when needed in order to maintain fast sample rates while also updating fast. Agilent-designed MegaZoom IV custom ASIC technology combines the capabilities of an oscilloscope, logic analyzer, protocol analyzer, and WaveGen built-in function generator in a compact form factor at an affordable price. 4th generation MegaZoom technology enables the industrys fastest waveform update rate with responsive deep memory acquisitions. 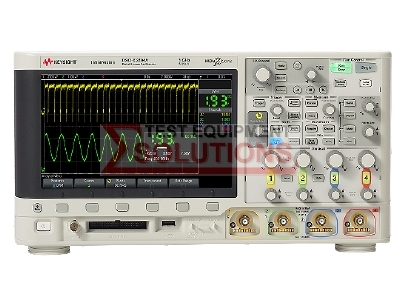 We offer the refurbished used Keysight (Agilent) DSOX-3104A 4 Channel 1GHz 5GS/s Digital Oscilloscope for sale and rental. The Keysight DSOX-3104A is fully tested and refurbished in our in-house ISO9001 calibration laboratory. We supply manuals, accessories, full warranty and a free-of-charge Certificate of Conformity. We can also provide the Keysight DSOX-3104A with a fresh calibration for a small additional charge. If you have under-utilised test equipment talk to us about trading-in or part-exchanging it towards the Keysight DSOX-3104A or other refurbished test equipment.